The famous board game we have loved since we were kids has now been given the remix treatment for people of all ages to get creative and design their own boards and games. Just think about the countless variations and new gameplay tactics that can be introduced by having the ability to create a board and add as many or little premium tiles as you wish. TGWG is a game changer..
Fuse Mobile is a boutique, medium sized studio with a talented team of people that have worked together on a number of diverse and exciting projects. How do you improve on the 75 year long popularity of Scrabble? CAN you improve on the original concept that, as a traditional board and pieces game set, is estimated to have been sold in 120 countries and is in 1 in 3 homes in the USA? Not easily, at least, not without some good ideas! Which is where TGWG comes in! What does scrabble do well? We will keep that. 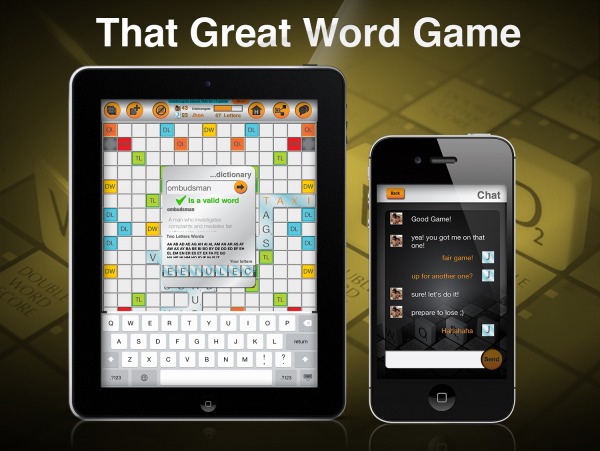 What’s good about Scrabble that can be improved with the power and connectivity of today’s devices? There are plenty of things that can be done! 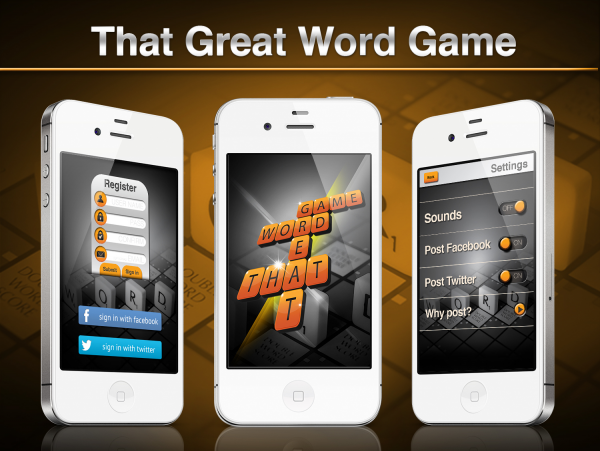 TGWG combines and balances both things and offers it in one place: keep what’s good.. and add and improve with what’s new! Firstly, why stick with the standard 15x15 board? Why not offer something smaller or larger to make for more challenging or faster games? Just throw it open to an editor to make whatever size you want and you choose what works for you! Secondly if resizing the board then why not place the premium tiles wherever you want? and make any combination you want for some awesome scoring possibilities? 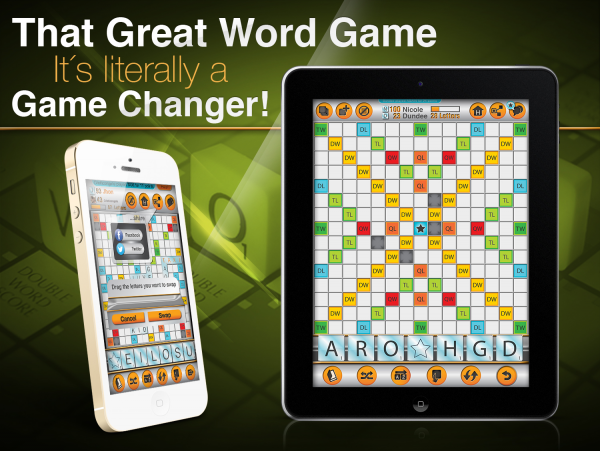 Also add entirely new premium tile types such as quad word, letter and blocking tiles to make it as interesting as you want! Lastly, share your creations with your friends and the world! TGWG aims for that rare goal, to do something familiar, and that users want, yet offer a fundamental improvement without making it more complicated and hard to use. 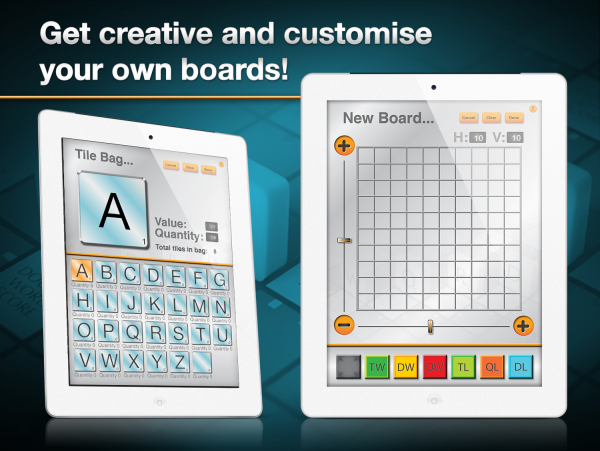 It takes the classic game of “Scrabble” and brings it to a whole new level by being configured with multiple ready to go boards of familiar and popular layouts and extends it by providing an editing facility to create any board of your own design with millions of creative possibilities not possible by any other offering. This editing facility means that instead of relying on the imagination, and timetable, of the developer it opens up the application to be extended and improved and shared by anyone in the world at any time! TGWG has strong social and sharing connections built in so as well as doing great things yourself and sharing with others, you can see what others have created, and which are the most popular, or newest, with simple taps. With built in Facebook sharing you can let your friends network know what you’re playing, where to find it, and they too can join in the fun. TGWG is delivered on the iPad and iPhone and offers optimised portrait and landscape layouts with selectable left and right hand orientations making it convenient and accessible to all. Engagement with the app is designed around being quick up and ready to go. Registration is a once-off step and can be totally anonymous with any name you want or by using your existing Facebook or Twitter profile so a simple tap gets you up and ready to go without any further delay. You can even log in and out with multiple profiles making it easy to share the device with friends or family and keep your games separate. When the app is opened it starts at a home screen where you have immediate options to create new games or tap into your existing games making it quick and easy to get it out and use within seconds. From any board that is being played all the commonly needed controls are placed for single tap access and gestures are supported such as pinch zoom, and swipe to next game to add further natural interaction. Returning from any board to the home screen is just a convenient single tap away to go into other options such as custom board editing and changing preferences. Marketing involves raising awareness of TGWG in every possible and reasonable sphere, which of course is very fragmented and each involves a different approach. Press Release - paid marketing to send material to bloggers and influencers to raise interest and make mention in relevant areas, e.g. gaming sites. Participation in online game forums - where terms of service allow mention and promote the existence of and store links to the app to active gamers. Personal networks - the app can post games and activity to Facebook logged in users to let friends, and friends of friends know about the app, and where to get it. TGWG also adds a financial incentive to personal network sharing by trading off 1 in-app purchase in lieu of being allowed to post to the user’s wall further enhancing the chances of spreading the word in this way. Privacy and anonymity, if it is wanted, was designed into the app from the very beginning. On first use a registration step is needed to name the player to make game play possible. This naming can be done in one of 2 ways and the user has the choice of what they prefer. For convenience a Facebook login is possible with a single tap, in which case the player name is taken directly from their existing Facebook profile. For total anonymity the user can simply enter a plain text username and password and can be up and playing within seconds with no identifying information needed at all to engage with the app fully from then on. While some apps require user email and then sending and clicking on email link before activation an email address field in user profile settings does exist within TGWG but is totally optional. The only time this email field is ever used is for automated password recovery, and even if supplied initially it can be removed later at any time so privacy is totally and always under complete user control.